If you have any other questions! Firstly it is always good to get advice on any major improvement to your property. Wood floors are a major part of your home and making the right decision on floor coverings will not only add appeal and value to your property but even save you money in both the long and short term. Wooden floors are very practical and have a natural beauty and warmth all of their own. They can enhance the most ordinary of rooms as well as adding the finishing touch to an already superb decor. 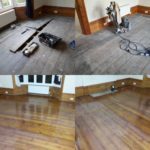 Now that you have decided to have floors sanding & refinished I would first check in an obscure part of your floor perhaps a corner or underneath the house, to check that you have floorboards under your existing floor coverings. Yes we have floor boards. Can we sand the floors ourselves? There are many shops that will hire equipment to sand your wood floors, however this equipment is constantly being used by amateurs and as a result are usually unbalanced and far from the extremely expensive state of the art floor sanding machinery used by Absolute floor sanding. How do we know if our floors are fit to sand? How much will it cost to sand my wood floors? Type of floor finish to be used: polyurethane, stained, waterborne etc. What you can expect when your floors are professionally sanded & refinished by Absolute floor sanding? Sanding and refinishing a beautiful wood floor is a skill acquired over many years. Bear in mind that, as all the work is done by hand controlled floor sanding machines and applicators, there can be evidence of this in the floor. Further as you live on the floor it will gain a character and feel that is unique to your home. This is all part of the beauty of owning a wood floor. there will be a small amount of dust throughout the rest of the house. Do not expect any areas filled with filler to have the same feel as the timber after application of coatings. Any silicone on a floor will cause rejection of subsequent coats of wood floor finishes. Silicone or silicone based products also include Fabulon, hair spray; fly spray etc. 12 volt down lights produce a cobweb effect on the coatings. Black Japan (bitumen) or stain around the perimeter of some older wood floors may produce a two tone effect. As most coating systems require overnight dry times the usual job will be a minimum of one/ three days. This time frame may be extended depending on the size of the job. As an estimate, most floor sanders would be able to sand on average 30/40 square meters / day. Remember to add the time for the coats to be applied and dry after that. Will there be much smell? And can I live at home while my floors are being sanded? Yes it will smell. Waterborne finishes are the most environmentally friendly, therefore produce less odor, All other finishes will generally require you to be in a well ventilated separate area, if you are to stay in your home whilst the floor is drying. However, as every job is different, please contact Absolute Floor Sanding on our advice concerning your house layout or coatings used to ensure they meet your requirements. What floor finish should we use? Polyurethanes are currently the most widely used floor coatings. They are extremely durable, readily available and come in a range of finishes from high gloss to matt. If you are using new wood floors please check with your wood floor supplier as to their recommendation for a suitable coating as some recommend only waterborne or oil base coatings to be used because of their flexibility should movement in the wood floor arise. The sheen (shine) level on a floor is entirely a personal choice. Factors which could affect your decision include: whether the areas have down lights - a lot of light on a high gloss floor will cause glare. Whether you clean the floor regularly - gloss floors show a lot of dust, due to their reflective nature. If you have pets inside - pet’s nails can easily scratch the harder finishes, causing them to look worn more quickly. Currently satin is the sheen level in highest demand on wood floors. What will I have to do to prepare the floor? Most coating will dry overnight assuming mild weather conditions (15 to 25 degrees C) however 7 to 14 days for full curing in the case of polyurethane is suggested by most manufacturers. Any normal traffic should be avoided during this period of time. Small items residing in fixed positions may be put in place carefully provided they have protective tips underneath them within 3 to 5 days check with Absolute floor sanding or coating manufacturer to make sure there is no misunderstanding on this matter as many floors are damaged in this crucial period. Is floor sanding a messy job? Our floor sanders are 90% dust free, however there will be the remaining dust floating during the sanding process, which unfortunately cannot be avoided. However if possible we will leave the windows open in the rooms that we are working in, this is to allow for ventilation and release as much dust as possible. We will always maintain a very clean service; insure that all furniture is covered up and doors are sealed. We clean up as much as possible during our work and then a very thorough clean up once our work has been completed. How reliable are your floor sanding services? Absolute floor sanding & refinishing have a very reliable and professional team. We pride ourselves in our work as well as reliability and efficiency. We always treat our customers as top priority and nothing less. We aim to satisfy our customers 100%. Check out our Facebook, Twitter, Instagram, Google+ accounts to see some of our customers who tag them selves in our posts. Absolute floor sanding services covers London, Surrey, Sussex, and Essex, so we can be in high demand. That's why we have made sure we have enough of the greatest and most professional floor sanding teams. Making sure that we are able to fit you in for the times and dates that suit you best, or the closest possible to what is required. How costly are your floor sanding & refinishing services? We are one of the most competitive and reasonable floor sanding companies with our costs. We aim to beat any other quote that you have received from another floor sanding company. Not only are we unbeatable in cost, we are also very unbeatable in quality. Take a look at our floor sanding cost's page for more info. What about all of my furniture'? We can assure you every single possession in your property will be completely taken care of. However we do require the wood floor clear for our floor sanding team. We will gladly help take care of moving any heavy furniture that you may not be able to manage to move yourselves. Alternatively if any furniture cannot be removed from the room we are working in, don't worry we can carefully move it to the side and work around it. This has been the case plenty of times so we certainly know what we are doing. We will cover up any furniture to prevent dust getting to it from the floor sanding process. What colour wood floor can I have? That is entirely your choice, whatever colour suits your taste we will match it. We will lay down as many samples as you like on your wood floors to help you decide. We have a range of stains so plenty of options that you can choose from. Payment for our work is due on completion, we accept cash or bank transfers. We ask for a deposit on all work, (generally £100-£150) this is for our security on materials. Also if you require any flooring and require us to provide this for you, we ask for this payment upfront or on arrival of our work. We can then collect what is required from our supplier's efficiently and as quickly as possible. We certainly do, Sunday's also. If we are half way through your work on a Friday but you would prefer us to come back on the Monday, let us know and this can be arranged. Can you provide me with any references of your floor sanding work? We in the office are here: Monday - Saturday between 8:30am - 7pm and Sunday 10am - 4pm. Our team of floor sanders work from Monday - Saturday 8:30am - 6pm and Sunday 10am - 4pm. If you require us to be with you at a earlier time start which is more convenient for you, this is not a problem. Do I have to be there whilst the floor sanding is being done? As long as we can gain access, then no you can leave us to it. Absolute Floor Sanding only hire's its own team, we does not sub-contract our work out. Should I paint before or after the floor sanding? Generally speaking as we have much heavier floor sanding equipment to work with it nice for us to be in first. However if you are not planning on decorating then we use dust free floor sanding equipment, so its up to you! Can you do commercial and domestic floor sanding & Refinishing? Absolute floor sanding works in both domestic and commercial properties, often having to work along side many other trades. 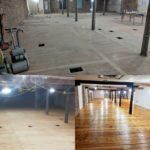 I have a commercial floor sanding project, do you work nights? 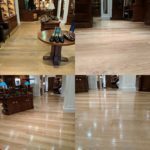 Absolute floor sanding has undertaken many floor sanding projects, for commercial customers during the night, generally whilst the shop is closed. We have the area completely clear and clean ready for customers the next morning.